With Paris-Nice done and Milan-Sanremo coming up soon it’s only a short ride along the coast between their two finish lines. Along the way there’s plenty of interest to the sport, from fine climbs, star gazing and a cycle path that’s so good the Giro used it for its opening stage a couple of years ago. Plus the definitive answer to whether it’s San Remo or Sanremo. The Route: Nice is right in France’s south-eastern corner and the coastal roads lead to the Italian border and onwards around the coast to Sanremo. It’s 58km one way if you stick to the coast and you can return via longer routes that take various cliff roads, the corniche roads. The Feel: the Nice seafront is lined with palm trees, a clue to the consistently good weather. Think of a French version of Miami but don’t get illusions of Don Johnson types, it’s less white suits and more white hair as you quick notice the prevalence of senior citizens living out their sunset in the sunshine. Once on the move choices open up right away and one option is to take the corniche road and to climb to the village of Eze. This is the Col d’Eze, a staple of Paris-Nice and one of the few roads where people shared and compared their climbing times long before Strava. Hug the coastal road and the next place is the Principality of Monaco, just two square kilometres and the world’s most densely populated state. Among the inhabitants are many pro cyclists. Monaco conjures up swank images, an imaginary playground for the wealthy complete with visual imagery supplied by the Formula 1 Grand Prix. 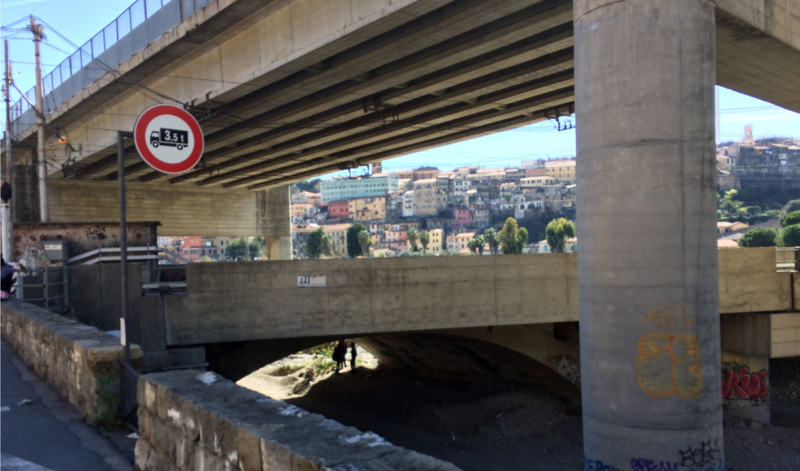 The reality for the cyclist riding through is far more humdrum thanks to a labyrinth of tunnels and heavy traffic, you may see Ferrari or a Bentley but chances are it’s going nowhere amid the Fiats and Renaults. Cross back into France and Menton is the next town and the last stop before Italy. Stop? This is where many have started their rides, or at least the serious part. Menton is the town where a thousand lap buttons have been pressed on bike computers as it’s the starting point for the famous Col de la Madone. There are several ways up but one route is famous in cycling as a training climb. Like other things in cycling Lance Armstrong made the Madone famous but others were doing it before. This is a long climb at 13km and its easy access means many local riders can replicate the effort of climbing an Alpine pass without having to go any further into the mountains. By all means start your stopwatch but if the effort doesn’t take your breath away hopefully the views will as the upper part amid the arid pine scrub is very scenic. There are also other routes inland which don’t climb so high allowing you to explore the back country. But instead carry along the coast as Italy awaits. The Italian border is crossed with ease as the cyclist is just nodded through by the machine-gun toting soldiers. You’re supposed to have ID but nobody ever checks a cyclist. It’s heavily guarded these days because France is in a state of emergency following terrorist attacks and also because of the so-called “migrant crisis”. At first there’s little change in the surroundings with large villas and larger gardens tumbling down to the sea. It’s only when you get to the town of Ventimiglia that it feels like Italy as the road begins to crack up and the town has a dustier, dirtier feel. The migrant crisis is visible as groups of men wander around, others live in makeshift shelters under railway arches and some can be seen washing their clothes in the Roya river. Half an hour ago you were in Monaco. It’s here you can head inland for the first time without having to scale a mountain pass. The Roya valley is where many a local pro heads for a training session on their TT bike or to do some motorpacing. The valley is wide at first but narrows and the road slowly picks in gradient. After leaving the village of Trucco there’s a series of tunnels which can be avoided if you take the old road to the left of this tunnel, there are two short dirt sections, the price to pay to avoid the long tunnels. Up to you to pick your route, to continue up and then down the valley or to chose one of the many mountain passes that branch off the side. Continuing along the coast and soon after leaving Ventimiglia there’s another turning inland and another flat valley road to explore. 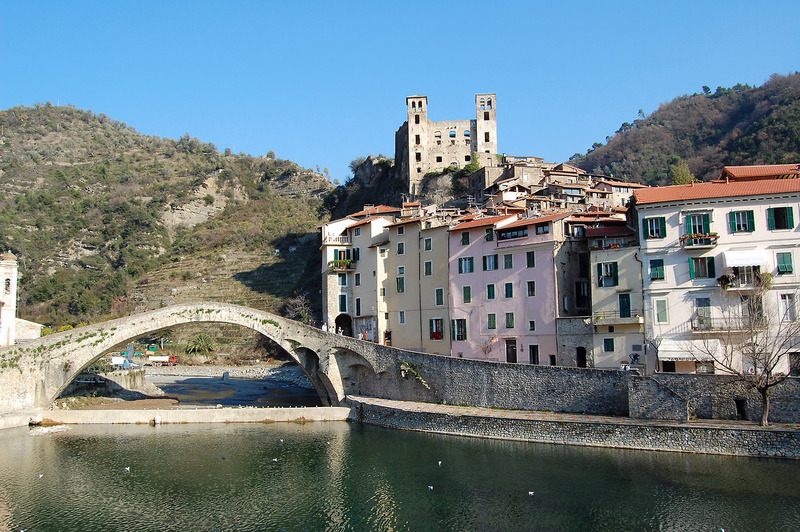 This is the Monaco pro’s recovery day destination, a spin to the village of Dolceacqua to enjoy an Italian coffee beside the river. Ventimiglia turns to Bordighera which turns to Sanremo. This is the Via Aurelia and it tracks the coast, keep going and you’ll reach Rome. The road is often a block inland from the coast meaning it’s built-up on both sides and so not as enjoyable. Sanremo’s famous for the spring classic but to most Italian’s it’s better known for its music festival where pop stars sing songs, as well as its flowers. At Sanremo you can extend the ride by picking up the coastal cycle path, a reclaimed railway line and used by the Giro d’Italia for the opening stage, a team time trial. You’ll ride in reverse to the Giro from here and it’s a great asset. It’s packed at weekends with locals on their way home from the market so if you’re in a hurry stick to the main road but try it because the tunnels are well lit and decorated with cycling themes, one tells the story of Milan-Sanremo. The path continues to San Lorenzo al Mare where you can rejoin the main road. Double back a few hundred metres and you’ll see the junction with the pink building and signs for Cipressa and Costarainera, here starts the Cipressa climb. The Verdict: a spin along the French riviera and into Italy sounds idyllic but the roads are often crowded and full of roundabouts and traffic lights so it might link two famous finish lines but racing between the two is hard work. It’s fine for a recovery ride but don’t use this stretch expecting an unbroken workout, even trying short sprint intervals is risky given doors opening on parked cars and dogs and their owners sauntering across the road. So a road not to ride? No because the options inland are mouthwatering, you can do the Cipressa, the Poggio, the Madone and the Col d’Eze as well as plenty of other unsung roads where you’ll find more goats than oncoming vehicles. This is a great area for riding with climbs that don’t get the Tour de France or Giro limelight. History: there used to be a race from Nice to Alassio, a town further up the coast from Sanremo so this route has been used for racing, appropriately enough called Nice-Alassio. It became Monte Carlo – Alassio in the late 1980s and died off in the 1990s. John Foot’s Pedalare! says the race was created as a tribute to Alfredo Binda. Binda won five editions of the Giro and much more and spent his early years in France as a plasterer in Nice making him an adopted local. Frenchman René Vietto was from the coast too and became famous in the 1934 Tour de France for surrendering his wheel and then his bike to team mates, an early “moral winner” for the public. Legend has it that he lost a toe to infection and that it’s pickled in a jar somewhere in a bar. 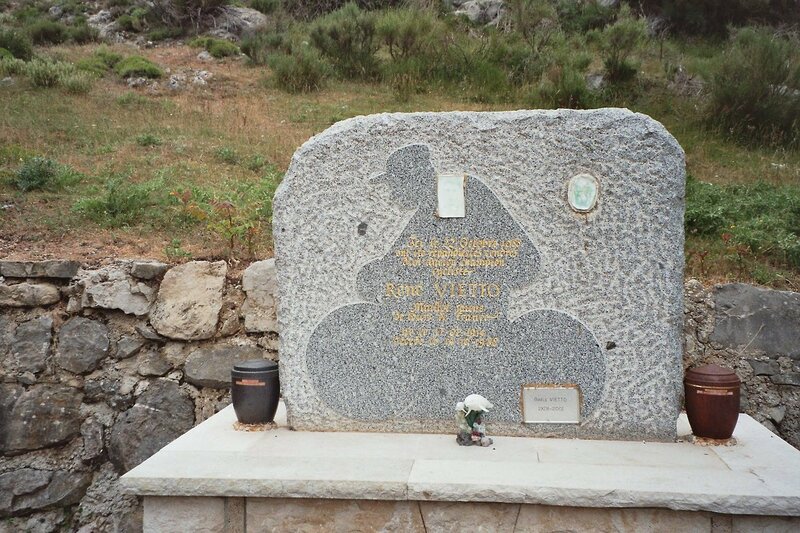 There’s a memorial to Vietto atop one of the local climbs (pictured). Today the region produces few pros, most come to reside. Monaco: of course there’s the sunshine, nearby Nice airport has good connections but foreigners living in Monaco come for one reason: tax. Or the lack of it given the state doesn’t levy income tax, nor wealth tax nor capital gains. However people pay for this in other ways, the rent for a one bedroom apartment starts at €3,000 a month, five times the comparable rate for somewhere else along the coast. If you want something a bit better appointed with room for two bikes, some luggage and room to spare then you can easily pay triple this. But for the millionaire athlete paying €100,000 a year in rent works out cheaper than paying income tax elsewhere. Not Monaco: French citizens get no tax breaks and US citizens are taxed regardless of residency which helps explain why the likes of Taylor Phinney and Tejay van Garderen live in the area outside Monaco, the same reason why the likes of Thibaut Pinot and Romain Bardet might visit but don’t reside. Star spotting: often you’ll see a professional cyclist, perhaps even a small pack, out for a ride. You might see several cyclos in their wake, like remora sucking onto a shark. This is unique because you can’t go jogging with Usain Bolt, do nine holes with Dustin Johnson or kick a ball with Lionel Messi but you can and will find many famous pro cyclists on this road every morning. As a rule they’re out doing their work so don’t expect a chat or a selfie but if you’re on the same road at the same time do say hello and if they pass and you fancy picking up the pace, consider asking if they mind you sitting on their wheel. This is a courtesy you should extend to any cyclist if you want to sit on but as they’re at work be prepared in case they say offer a polite “I’d prefer not” because you might be the safest wheel in the world but how are they to know? Corniche? It’s a French word meaning a ledge and describes a road cut into the mountainside. Sanremo or San Remo? Sanremo. The story goes that during Italy’s fascist period it was labelled San Remo and so as pushback it’s been renamed Sanremo. If you’re in doubt, satisfy yourself with this 56 page official decree. Monaco or Monte Carlo? 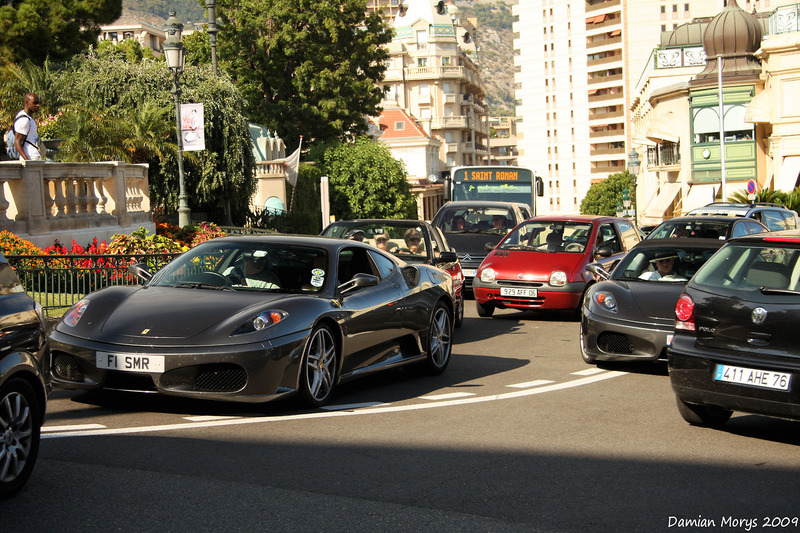 Monte Carlo is part of Monaco. Travel and Access: Nice has an international airport with short and medium haul flights. There are road and rail connections too. If you want to stay in the area Menton is a good pick because it is a scenic town but there’s plenty of choice in the region. Just do your homework, there’s a lot of crummy accommodation. If you want more value, look across the border into Italy. The weather is good year round but it’s relative, the presence of plenty of citrus fruit signals no frosts but climb into the mountains and it can be cold. Avoid July and August as it’s packed with summer tourists. Brilliant. You even noted the opening doors from parked cars. Chapeau. great piece as always, thanks inrng! anybody got an idea where to rent one for a day/a couple of days if i manage to charm her enough to maybe slip away for a couple of hours to pursue this seemingly nice trip? all tips are very much appreciated! Café du Cycliste offer a great service and are really nice guys but it’s top-end stuff and you’ll be spending a lot as a result. Speaking of help for a bike rental. Can someone recommend a rental in Florence? Short trip for a week with wife as well, and can’t justify flying bike from California. Love that, thank you very much. The images in my head remind me of Edward Fox driving into France from Italy in The Day of the Jackal. The book’s better though. Ahhh one day….the cycling that is, not the assassination. The border crossing used in the film at Menton is still there, they did film it on location in the right place. As an added curio, the Jackal hired his Alfa Romeo in Milan and drove to Sanremo, before crossing the border. And it’s also spelled San Remo in the 1971 book, though written by an Englishman. I had assumed that San Remo was the English for the Italian Sanremo. So the race would either be Milan-San Remo, or Milano-Sanremo. And, for example, it’s always “Montecarlo” in Spanish, while in Italian both “Monte Carlo” and “Montecarlo” are used (the latter was more common some twenty years ago or so). I lived in South of France for many a year, reading this adds to my regrets for ever leaving there. Pyrenees was my stomping ground. Live in Nice right now and more or less agree. While the coastline is lovely, the coast road is too busy, particularly on the Italian side (where the fantastic bike path is a godsend given the slightly aggressive overtaking). Sadly the Grande Corniche is closed between Eze and La Turbie so going in that direction up high involves a fair bit more climbing. By now you can go inland and avoid all this. Straight away you get off the coast road near San Remo up to Cipressa etc, it gets so much quieter, lovely little hills. Thanks for another interesting piece making me wish I wasn’t stuck in an office. Do cyclists get waved through on most borders? I’m possibly go from Italy to Switzerland and vice versa and was wondering about passports. Cheers – one less thing to carry! They never seem to check but of course the one day it matters will be the one time they stop you, strictly speaking the law says you need to have ID on you. They used to, legend has it that Gino Bartali used this to smuggle travel papers in and out of Italy during WOII in order to provide a way to escape the fascist regime for Jewish families. That’s no legend. He really did that. An extraordinary man. Nice bit, thanks. Had to laugh at “This is the Via Aurelia and it tracks the coast, keep going and you’ll reach Rome.” Kinda, sorta I’d say. Sadly, every time I drive up from Rome along the superstrada (think two lanes in each direction, almost zero shoulder and bordered by steel guardrails) I see what appear to be touring cyclists on this dangerous, high-speed (90 kph limit) roadway. I’m counting the hours until MSR 2017 and the start of the real pro cycling season. Very good. I was there a couple of years ago, based in Nice. I’ll admit to umming and ahhing a bit before braving the main road tunnel in Monaco (not the one on the GP circuit, which is fine). Admittedly there are no signs to indicate that bikes aren’t allowed, but it is nonetheless an unnerving place to enter – shades of Dante at the gates of Hell. I went with my wife. No way she was riding through the tunnels. We ended up using lifts and back streets to get to the quai. Top luggage tip- you can check in your bike bag/box in the airport in Nice (Terminal 2- A04) for 18 Eur/day and the bike path starts just outside the airport. Just pack light and you’re off. Didn’t get to ride there, but I thought Nice and the environs were fantastic when I was there a few years ago. I say this only because Nice gets “dissed” in the tourist literature in the US, when in fact it is a great area. As a classical history geek, my absolute favorite part was discovering La Tourbie on foot after walking up the hill from Monaco (which is “eh”). I had no idea it was there, and drinking from the fountain in the village, where the Romans likely also drank, was a great thrill. And hiking in Sospel, with what turned out to be Mycoplasma pneuomonia, and falling asleep on an old bunker. I’m dying to get back with my bike! Great comment. Hope you get your wish and you’ll have a blast! spent a week in menton 2 summers back and had an amazing time. walked down the promenade to the old city and ran into richie porte and renshaw having dinner. the rides up madone and col de nice were super fun with amazing views. cafe du cycliste is the best option in the area in my opinion. Oh and I forgot to ask: Why is the option to sign up for comment notifications per e-mail gone? You probably explained it then but I obviously missed that post. The subscribe to comments was an unsupported add-on that was starting to cause bugs with the software that runs the website as the main software has had several updates but the add-on hasn’t so it was binned. If people want it I can look for a new one. I would like to see a similar functionality back. Have you ever thought about implementing Disqus? From all the commenting software / platforms I have come across it is the best and works really good IMHO. God, why the decree has to be 56 pages long. It’s not like they are printing in 72pt fonts either. Nothing constructive to add, just thanks very much from this resident of Nice. All fair comment and true. The best time to come is about now. Was disappointed to find the grande corniche genuinely closed and thoroughly blocked off between Eze and La Turbie when I struggled up there on my old Trigger’s Broom last Monday. Apparently it’ll reopen at the end of May, but a pinch of salt may be needed with that information.